Are you in the printing or ink industries? Are you looking to reduce wastes and save money? If you answered yes to both then look no further than solvent recycling. Businesses within the printing or ink industries use a tonne of solvent, and many are spending a significant amount of time and money when it comes to recycling these solvents. Staying competitive is all about keeping costs low and being efficient with your time, and recycling your solvent can help your company make huge strides when it comes to both. Recovered solvent is as good as new and can be reused in your process without any negative side effects, saving you time and money on purchasing new solvents each time. Recycling your solvents will help your business reduce the amount of solvent you use and the amount of waste you produce. As well as reducing costs and becoming more time efficient, your business will be able to market itself as environmentally - clearly demonstrating green initiatives that are designed to cut down on waste. What’s to lose? How does solvent recycling work? Simply put, on-site solvent recycling units work by separating waste solvents into reusable solvent and waste residue. Printing and ink companies can then use the recycled solvent and simply dispose of the waste residue. 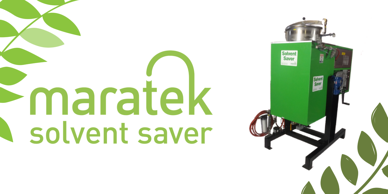 Typically, with the use of high-quality solvent recycling equipment such as that from Maratek, recycled solvent will be around 95 per cent reusable with around only 5 per cent that is waste residue. On-site solvent recycling equipment can be designed to handle many different outputs, simple applications with minimal automation, to continuous units that are constantly and automatically recycling your solvents and even designed specifically for the individual needs of your company. No matter your needs, your solvent recycling should be designed to perfectly integrate into your production process. These figures are from reduced solvent purchases and waste disposal, based on $8/gal solvent purchase price and $3/gal waste disposal price. Not only that, but they will can also improve your business processes and make your overall organization more efficient when it comes to solvent waste. Maratek is an award-winning industry leader which has been supplying industrial manufacturers with uniquely designed solvent recycling equipment for more than 40 years. The Maratek Solvent Saver Printing (SSP) equipment is specifically designed for the printing and ink industries. The SSP uses multi-stage vacuum solvent distillation process that separates solvent into its components at lower-than-boiling point temperatures. Waste solvent waste residues are self contained within the unit. Distilled water can typically be sent down the drain, with reclaimed solvent ready to go straight back onto the press as good as new. We pride ourselves on the ease of use of our machines. The SSP unit an off-press automated solvent recycling machine that, once installed, needs very little attention and no specialist skills to run. The only labor required is the switching out of drums and the use of our LCD touchscreen interface that starts and actions the recycling process - operation is fully automatic. Not only that, but its explosion-proof design means the SSP is safe for installation within the pressroom.